Here is a selection of the top rated slow cookers I have tested and reviewed for you. I hope that you will find this list useful for making your choice. If you have any questions, or wish to have a particular slow cooker tested and reviewed for you, please post a comment at the bottom of this page and I will be pleased to respond to you in the shortest possible time. At home, we appreciate a good meal whose aromas are revealed over the course of cooking. Nothing beats a dish that simmered for a long time. However it takes time and that’s why you want to buy an electric slow cooker. Unfortunately there are so many choices. In the course of a research, we can come across well known, or less known brands (KitchenAid, Cuisinart, Crock-Pot, Chefman, etc.). It is not easy to distinguish between the various functions and which model to choose. In this buying guide, if you want to make a quick decision without going through all the details, you will find a listing of the top rated slow cookers. Others will discover which electric slow cooker to choose according to their needs. What is an electric slow cooker? The electric slow cooker is a device that allows you to prepare delicious simple dishes, but also more original recipes from all parts of the world. You can make stews, braised roast, beef carrot, etc. In terms of cooking appliance, do not confuse the electric slow cooker with the multicooker or the Cookeo which is a creation of the French brand Moulinex. The multicooker offers several types of cooking: simmered, sauteed, steamed, etc. It usually costs more. The Moulinex Cookeo looks a little more like a slow cooker, but offers less cooking options because under pressure. The result is not exactly the same either. It’s up to you to see what you prefer to cook and what device best suits your needs. How to choose your slow cooker? I guess that you want to buy an electric slow cooker that fits easily in your kitchen (and in your preparations) and has a long life expectancy. Nobody likes having to change their devices after a year. Slow cookers can receive from 2 to 8 liters of preparation. For single people or couples, the ideal is a mini slow cooker like the Crock-Pot 2.5 QT (2.6 liters) for 2 persons. For families of more than four people, you must immediately switch to a model of at least 6 quarts / 5.6 liters. It is advisable to opt for a terracotta slow cooker, with an enamel coating and a glass lid (to follow cooking without ever opening). The most expensive models offer various options: digital screen, handle, timer, keeping warm, heat probe, cookbook, etc. Your budget will certainly limit you in the possibilities, but carefully think about your needs before ordering. Find out about the coating, but also about the possibility of putting the whole thing in the dishwasher or not. This type of device is becoming easier to maintain, but it is worth thinking about it. There are two things to look at: color and shape. An electric slow cooker can be round (perfect for soups) or oval (ideal for chickens, meats, etc.). They are often available in red or metallic color. you can find them also with a design. Personally, I like the Crock-Pot SCCPVL610-R-A 6-Quart which I am going to review further on. Why buy an electric slow cooker? In general we plan to buy an electric slow cooker, because we like to cook dishes simmered and we want to simplify our everyday life. Indeed, there is no monitoring to do (just the timer to remember to start). It is an easy to use device. And it can even save energy, because it consumes less than electric plates to simmer for a long time. What is the price of a slow cooker? For those who want a cheap electric slow cooker, it is possible to find interesting models for about $30, like the Hamilton Beach 33473 Programmable Slow Cooker, 7-Quart, Silver. The most advanced models may start from $100 or more for a very good one. How to use your electric slow cooker? Remember to pre-cook the meat and sauté your onions and garlic in a frying pan beforehand. As the cooking is done with the lid, it is not necessary to put a lot of water in the cooker. There will be no evaporation. However, it is important not to lift the lid. In fact, do not touch the lid until almost the end of the cooking. Indeed, every time you open the slow cooker, there is a loss of heat and a loss of water. As a result, you increase the time needed to finish preparing your dish. As the cooking is done on all sides of the device, it is not necessary to mix regularly. To simmer, let the appliance do it! The manual slow cookers, also called traditional slow cookers are very basic. These are the cheapest because they are simply equipped with an on / off button. Slow cookers equipped with a “thermoelectric” probe which are suitable for cooking meat. Then the programmable slow cookers which look like the traditional electric slow cookers, but they have one more option: the delayed start. So yes, cooking with a slow cooker takes time. But using an electric slow cooker saves YOU time because you do not have to stay close to check on your cooking regularly. It is also an easy-to-use device, there is almost no button to manipulate, no adjustment. Finally the energy savings achieved are not negligible throughout the year. The main problem I find with cooking using an electric slow cooker is the time needed to prepare a dish. But hey, that’s the idea when you get something to simmer, all the ingredients have to spend time together. I’m like you, I also want to eat good food, with carefully selected ingredients, without spending hours. Simmering is not always the ideal solution to optimize your time. Yet with an electric slow cooker, it is possible to enjoy good family dishes while letting the timer to take care of the monitoring. I hope that you will now be able to order the slow cooker you need and find the pleasure of a tasty cuisine, which is prepared even when you are not always at home. Yes, it is possible to throw a dish safely together while you go out to get your son from his judo class or you go shopping. This is a very popular 6-quart Cook and Carry Slow Cooker which will serve 7 and more persons. Its digital timer allows you to schedule cooking periods anywhere between 30 minutes and as much as 20 hours; it changes temperature settings automatically once the cooking period has finished. It features this special easy to use shutting lid system which offers extra fastening for a minimum mess (know what I mean?). The oval-shaped detachable stoneware elegantly matches any occasion. All the Crock-Pot Slow Cooker detachable crockery parts (minus the lid) can safely be used in your microwave and oven if positioned to 400°F. In the event that you own a slow cooker of a different brand, make sure to refer to the owner’s guidebook for its specific allowances and limitations. This Crock-Pot 6-Quart Programmable Slow Cooker operates on 240 watts at 120 volts AC / 60 Hz. When ordering, make sure to order the model that is suitable for the voltage of the country you are going to use it in. Any questions? For a quick reply, please post them in the comment section at the bottom of this review. This smart Hamilton Beach 8 Quart Slow Cooker comes in an easy to clean metallic red color and it is just what you would need if you had to cook for many people as it can hold as much as a 6lb roast or an 8lb chicken. The stoneware and glass lid is okay to go in the dishwasher. Its adjustable settings can keep your food hot or warm after being cooked. As you can see on the picture, it also has strong full-grip handles. As we are very busy these days, and often don’t have much time for preparing delicious meals, a slow cooker is what you need. Just get your engredients in, set the appropriate temperature, the time to start and stop, and just go to work, to the gym, or visit friends. And when your family gets back home from work or school, they will be most impressed by your culinary skills. From time to time I receive from my readers some recipes. Although it is not possible to post them all here, and also not the purpose of this website, I sometimes select one among the best so that you have a good idea of what can be done with an electrique slow cooker. At the same time, it gives us a break in our research. Therefore, here is one that I have selected which I am sure you will like. Boil the cabbage in salted water with 1 tablespoon of baking soda and rinse with cold water. Flour meat, brown in oil, remove and place in slow cooker. Brown onion, leek, carrots, add thyme, salt, pepper, parsley, bay leaf, cabbage, garlic. Put all in slow cooker and add water, red wine, cube, potatoes. In a bowl filled with water, put 2 tbsp of flour and the tomato paste stir and add in the slow cooker. Put in the slow cooker for a maximum of 6 hours. With 4 manual cooking actions (slow cook, bake, stove top sear / sauté and steam), all in just one appliance. The auto-iQ tech permits you to choose a recipe, then put in your contents, and then it helps you cook! Featuring more than eighty pre-planned, chef-created recipes. Its accutemp technology handles specific temperature calculations that operates in the background making sure that your cooking plan isn’t becoming too hot, so that meals won’t over cook. It has a triple combination heat: side, steam, and bottom heat all operating simultaneously for an easy single bowl meal. The equipment automatically shifts to keep on warm mode when the slow cook, bake, or steam functions arrive to completion. This keeps your meal hot and set to dish out without being overcooked. You can also select your time and temperature for accurate cooking (only available with certain functions). Its lightweight permits you to cook just about anywhere as long as you are near a power wall socket, there useful for vacations parties, and also to take on college dorm room. Also easy to clean and is non-stick. As I said, you will love to own one of those so, I can easily recommend it as one of the top rated slow cookers I have reviewed for you. With its self basting lid. For those who don’t know what is a self basting lid: they are lids that are fitted on roasting pans with some indentations or channels on the inside of it specially arranged to gather and conduct condensation back onto the roast or whatever dish you are preparing. The “Oster Roaster Oven” will save you time in many ways. It is also an energy and heat saver thanks to the reduced cooking time. The un-usual higher domed lid allows you to hold a larger turkey (as much as 26 lbs). This multipurpose electric roasting appliance permits you to slow cook, roast, bake, and smart enough to even serve as is. It frees up most precious oven space when needed for particular moments when you need to cook a lot all at the same time. You will save 30% of your cooking time and 36% on your energy bill than with a regular oven. And of course, the self basting lid will save you the energy and time you would consume at basting. The creative defrost setting will take care of your poultry or roast from being frozen all through to fully roasted in just a few hours. The keep it warm position allows you to enjoy your guests until you are ready to enjoy. I have received another recipe from one of my readers who asked me if I could share it here on this website. This kind lady, Elizabeth (but she prefers to be called Liz) assured me that it is one of her favorite recipes prepared in a basic electric slow cooker (any brand will work well). So Liz, thanks very much for sharing this with us. I promised her though that I will ask all those that are going give it a try, to share with us here their comments. So, yes, please make sure to post here below, in the comments section, your impressions. 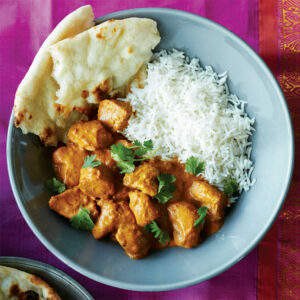 According to her, it is divinely spicy, but not too spicy, the Butter Chicken is a classic in most Indian restaurants. Love at first spoonful assured for this version done on a Crock-Pot! (but any brand of slow cooker will do as well). (measures are in metric, but I am sure that you will be able to do the conversion). 2. The, in a big pan, soften half of the butter on medium high heat. Dump in half the chicken and cook while stirring for 4 to 5 minutes or till tanned on every sides. Take off from heat and put the chicken in a slow cooker. Proceed in the same way with the rest of the chicken and butter. In the skillet, add the onion and cook, stirring, for 2 minutes. Add garlic and reserved spice mixture, and continue cooking, stirring, for a minute. Put in the onion mixture to the slow cooker. 3. In the skillet, mix the tomato paste, coconut milk and sugar, and cook scraping the bottom of the skillet to detach the particles for 30 seconds. Pour the mixture into the slow cooker and stir gently to coat the chicken and onions. Cover and cook lightly for 4 hours or until the chicken has lost its pinkish hue inside. So, thanks very much to Liz, and bon appétit! Also, remember to share your comments and perhaps your suggestions for serving and possible improvement. Okay, so I hope that you have enjoyed this recipe, if you have not tried it yet, you should really put a date on your calendar, 1 to buy your brand new electric slow cooker, and 2 to get the ingredients and give it a go. Wow! Isn’t that wonderful, or what? And for the cherry on the cake, it will prepare your succulent dishes 70 percent faster so that you can go about your business and come back home to a warm gourmet dish that your whole family will love, and LOVE YOU for that, forever. Otherwise, let’s continue with the amazing experience that you can have with it. And then, to complete our review, I must add that this little wonder has already received nearly 26,500 reviews on Amazon.com alone. 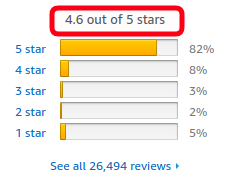 Rarely did I come across such record when reviewing products. The Chefman Slow Cooker, All Natural XL 7 Qt. You will be glad to know that it also comes with free recipes, and for those who are on the Paleo diet, it is the only naturally nonstick Paleo certified slow cooker. It is easy to clean and even dishwasher and oven safe and has been completely manufactured with the Paleo fan in mind with its naturally non-stick, PTOA, PTFE and coating free. Chefman has even gone further in order to give its customers a fantastic experience with a free access to the Club Chefman for all their yummy recipes, videos, cookbooks, support from a real Chef, and much more! So personally, I think that it is an excellent way of honoring their users. It is perhaps one of the reasons why they have so many great reviews. That said, as I have advised this lady, and it is also part of my recommendations at the beginning of this guide, do not let your budget be the only decision maker for choosing the size of your cooker. It is better to select one a bit larger for a few extra dollars, rather than going for one that might restrict you in time in preparing some delicious meals if you happen to have extra guests. Remember, it is a lifetime investment. I have reviewed the XL 7 Qrt., which has proved to be a good size for all occasions and kind of meals, but if you are sure of yourself, you can also select the smaller versions. Hopefully you enjoyed reading this page and found this website useful for selecting your slow cooker among the top rated slow cookers tested and reviewed here. My readers and I would love to hear from you and if you have anything to share, or have any questions, just use the box below and someone will respond as soon as possible. If you found this guide helpful make sure to share it socially and write a comment below, I will be most grateful! And if you are interested in more robotic equipment, for fun, as as hobby or your profession, I invite you to visit “Top Ten Robots“. These are great selection of slow cookers. There a number of benefits using such a cooker when prepare meals for your family. Slow cookers not only environmental friendly that it consumes less electricity but the foods prepared using these slow cooker are healthier as it helps preserve nutrients which could be lost if cooked too rapidly. It also makes the food more tastier as the flavor simmered into the foods. Thanks for your top rated slow cookers review article. This should help me when buying one in future. Thanks for sharing your views on the benefits of using a slow cooker. You seem to have done some homework and I hope that you intend to treat yourself to one soon. Any particular model in mind already Ammar? If you need any advice, please make sure to contact me, or ask here. Main while, I am inviting you to check back here by tomorrow as I am about to post a review for one that I have tested and I am sure that you will love this one. Thanks for reading my top rated slow cookers review. Love, love, love your top rated slow cookers review! I have recently taken up making bone broth and use the Crockpot Slow Cooker. This programmable slow cooker makes cooking broth a breeze. For beef broth I use the high temperature setting for 4 hours and then can adjust to the low temperature setting for multiple 10 hours sessions totalling 48 hours of cook time. At the end of either cycle it shifts to warming which keeps the cooking going. Thanks for reading my top rated slow cookers review Stacy, and for your comments. I am glad to know that you are the happy owner of a Crockpot Slow Cooker and can enjoy wonderful meals with your family, cooked basically on auto. Thanks also for your clever tip for the beef broth. 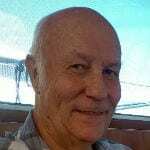 I hope that you have seen the recipes that I have posted upon request of some of my regular readers. If you have any in particular that you wish to share, please do send them to me and I will publish them for you. I never realized how many different options there are for slow cookers. I have a couple, but I do need a new one that shows the digital temperature, instead of high/medium/low. It’s much easier to control cooking with that sort of feature. I know that the Instant Pot has been really popular this past Christmas season. I’m considering trying that, too. It looks like you favor it as choice because of all the features it has. I appreciate the advice and the recipes. Thanks! Thanks for taking the time to comment on my top rated slow cookers review Sunny. You are quite right Sunny, it is worth getting a newer model if your cookers are already old. You will certainly enjoy the freedom of having a more modern one with all the bells and whistles. The Instant Pot DUO60 6 Qt has definitely been the most popular for quite a while now, and it is my wife’s favorite. I’ve got it for her birthday a couple of years ago and she keeps saying that it was one of the best birthday gifts that she ever had. And the price is definitely a bargain for what it offers and does. I am just looking at it right now and I see that the number of happy owners has already gone up since I wrote the review a few days ago. If you do decide to buy one, could you please do me and my readers a favor? Please come back here and post your comments about it (pros and cons). I actually just used my old manual flip switch slow cooker to cook some delicious chili two days ago. I have to completely agree with your statements about a lack of time to prepare some meals. This is the reason I love using slow cookers. You simply load it with ingredients before work and come home to a delicious dinner waiting for you. I think it might be time for me to upgrade my current model to something with a digital interface and a delay timer. Do you have any suggestions in the 4 to 6 quart range? Thanks for your top rated slow cookers review. Thanks very much for taking the time to comment on my top rated slow cookers review Atlas. Yes. I think that it is time to do yourself a favor and upgrade your older cooker to a more modern one. You won’t believe the difference. You can always keep the older one for occasions when you might need to have two on the go. As I explained in my reviews, don’t do the mistake of selecting the size of your cooker based mainly on your budget, because the price difference between 4 Qrt and a 7 Qrt could be just a few dollars, but the difference in cooking variety could be huge. So I am suggesting that you have a look at the Chefman Slow Cooker, All Natural XL 7 Qt. Pot. It costs only $49.99 on Amazon at time of writing and it has a lot of great reviews. If it really exceeds your budget and you are sure that a 5 Qt. will suffice (but remember that it will last you for years), then you also have the Chefman Slow Cooker, All Natural XL 5 Qt. Pot for only $19.99. Also with great reviews. I am sure that you will find the one that suits you best and if you have any questions, please do not hesitate to ask them here. You had just encourage mo to try the slow cookers because I got no patience to wait for a long time coking. With your top rated slow cookers review, I realized that eating good foods is to taste a really tasty recipes cooked in a slow cooker to bring out the flavor and aroma. Cooking at home is really the best choice if you have the time., but it is what we call cooking healthy foods at home…You just helped me pointing out what a slow cooker can do to have a healthy good foods…All the Best! Thanks for your regular visits to my website Shierly, and for your comments. I am glad that my top rated slow cookers review is convincing you that a slow cooker is the way forward to good and healthy food. I hope that you will make a choice soon and if you have any questions or need any help to make your choice we can work on it together. Thanks for the top rated slow cookers review. It so happens that I recently discovered the usefulness of it and I am having a great time with it especially with cooked vegetables. I like all the details you give and this is helpful as I need to get another one soon. Thanks for reading my top rated slow cookers review and for taking the time to share your experience with your electric slow cooker Eli. It is an amazing cooking utensil don’t you think. Whenever you are ready to change your old one for a newer model, and need some advice, please make sure to contact me. I am confuse about your site it is a good site but you are showing slow cookers on the first page and then you have robots on your about page but nothing else. I thought you were just advertising about robots and nothing else. Your layout is good and it is informative but you need to be more direct on your site. In other words if you are going to talk about robots then do that. Over all it is a good site. and facts and figures on Robots and latest news on the subject of robots. You might need to clear your browsing data and try again. Great review! And loved the recipes you shared. I have a slow cooker but seldom use it. Most recently, I came across a pull pork recipe using the slow cooker and gave it a try. It was amazing! The pork was easily shredded without effort. I will head over to check out the Instant Pot Multi-use Cooker. It is an interesting cooker indeed. As my family grows, I do need some help in cooking. In my case, the help from the cooking appliances. Thanks for going through my “Top Rated Slow Cookers Review”. and for taking the time to share your views Sharon. You will certainly need to upgrade your slow cooker as your kids grow up. You will have less time for cooking therefore, why not let the cooker do the job? So that you can attend to other important tasks. Your choice for the Instant Pot Multi-use Cooker is a good one, it has very good reviews and is very much affordable, especially if you calculate your time gained. Let me know if you have any questions and need help making your choice. Did you also have a look at the robot vacuum cleaners? They are also a fantastic time and money savers. Imagine going to the gym, or doing your shopping, and return home to find it super clean and your lunch or dinner ready to dish out to your family! A dream life. I wish you the very best for you and your family. Oh yes Douglas, so much progress has been made in basically everything automated, and if you do buy a new slow cooker, you will wonder why you didn’t do that earlier. Many people who have a slow cooker that dates back to a few years back, still buy an up to date one, but keep the older one, which comes very handy when they have a few extra guests for dinner. Thanks for going through my top rated slow cookers review and let me know if you have any questions and need help selecting the model that will be best for you. Thanks for sharing this top rated slow cookers review. I’m currently looking to buy one and I haven’t decided which one I should get yet, so good trimming for me to read your review. The recipes you share here looks delicious and easy to make! I use to cook spaghetti sauce often at home and I need to keep an eye on it as the recipe says it should cook for 4 to 5 hours, it will be easier in a slow cooker. Thanks for going through my top rated slow cookers review and for your useful comments Alejandra. I hope that you treat yourself to one, as you know it is very useful, and economical. Not to mention the delicious meals that come out of them. I’m glad that you liked my recipes, I am trying to find more to post, and also I am hoping that some of my readers will share theirs with us. Let me know if you need any help selecting the cooker that will suit your need best. I really like this website and it has some great content on electric slow cookers. I myself have been using the Crock-Pot 6-Quart Programmable Slow Cooker with Digital Timer for some time now and it is awesome. It works absolutely perfectly and i have not experienced any problems with it yet. However, I would also be very interested in the others you mentioned there, you seem like you know what you are talking about. Thanks for sharing this top rated slow cookers review. Thanks very much for your comment Tim. You are quite right, the Crock-Pot 6-Quart Programmable is a really good one. In fact it is the one that we have at home and we never ever had any problems with it since we have it, and we certainly use it everyday. I am glad that you enjoy yours as well. I have selected the top of the range for my top rated slow cookers reviews, so that my readers can make their choice in total confidence. Hope that you noticed that I am reviewing everything that is robotic for use in our daily life, such as robot vacuum cleaners, security alarms, etc. and the newest, robot lawn mowers (a very interesting one). Love your top rated slow cookers review! I appreciate the great information about slow cookers. I use my slow cooker to make bone broth about once to twice a week. The digital slow cookers make that process simple and easy. I use a Crockpot, Smartpot, 6 quart slow cooker with preset cook times. I use the 4 hour high setting to get the process started and then program 3 more 10 hour low settings to complete the process. The warming feature on the Crockpot works well for me if I miss resetting the cycle. Thanks very much Stacy for sharing your experience with your slow cooker. I am glad that you are making good use of it. The model you own is also one that is very much appreciated in many households. Please remember that if you have any recipes that you would like to share with my readers, do send them here and I will certainly post them. Thanks for going through my top rated slow cookers review. I wish you the very best Stacy. Thank you for your thorough top rated slow cookers review. They have certainly come a long way since I bought my first one! Even though there are only 2 of us in the house, I like the larger models so we have leftovers. Most slow cooker recipes are so easy–I used to prepare mine the night before, put the crock in the fridge & just pull it out to turn on in the morning before I went to work. These days, since we are retired, I don’t really have the need I used to so we bought an InstaPot. Sometimes we don’t decide what we want for dinner (or late lunch) until just hours before and the InstaPost has proven its usefulness for that. I believe they only come in a 6qt size? I wish they were a little larger or had a taller shelf so you could cook the meat on the bottom and have a shelf to add potatoes or something. Do you know of larger slow cooker/pressure cooker combos? Thanks for sharing your technique and experience with us Lisa. I agree with you, the slow cooker type is more for the busy working people and the InstaPot is more for the retired group of people like us. There are larger sizes in slow cookers, you can have an 8qt and even a 22qt if you want to. Just check for Slow Cookers on Amazon for best prices. Thanks for going through my top rated slow cookers review. I wish you the very best Lisa, and keep enjoying your retirement. 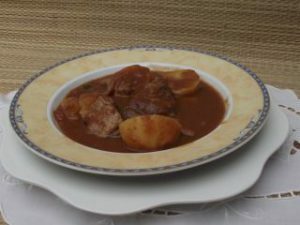 Not only you have a great top rated slow cookers review, you have also put great recipes which I really appreciate. This is what was missing in our kitchen and thanks to your review, I think the Chefman Slow Cooker, All Natural XL 7 Qt. will best respond to our needs. Thanks for sharing your views on the slow cookers Babacar. 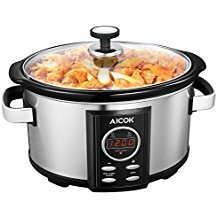 I am glad that my Top Rated Slow Cookers Reviews 2018 helped you select the one that will work best for you. I hope that once you have received and tried it, you will share with us your impressions and most delicious recipes.